Alui, 06 Sep 2012Nokia shares lost about 13% in value after the launch of these phones.Nobody can explains us how is that related with the launch of a wireless charging dual-core Windows Phone 8 device with City Lens etc... but yes , they did drop. so we finally have big guys from NOKIA, well i think 920 is just great ( well the 820 too). well 920 got a inbuilt 32gb disk space and additional 7gb (so u got approx 40gb) , hmmmmmm i don't think many people will need more disk space than that. more than enough for an average user and just enough for a heavy user. its true that these are not quad core but guys don't miss that these monsters have krait cores, i'm sure u guys have seen the performance of krait cores. becoz if u consider other dual cores, krait cores will be the best. so dnt worry about that. absolutely correct, i agree. HDMI connection is important but it lacks HDMI. lets just hope that upcoming devices get it. 5. no shock proof & no water proof. 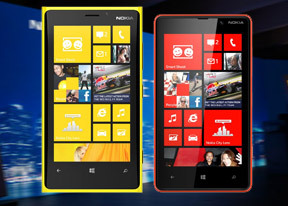 Nokia shares lost about 13% in value after the launch of these phones. Obviously, Nokia's focus in the design is to make the phones really stand out against the competition of black and white smartphones. The new Lumia's have very competitive specs sheet, certainly on par with the others but I really miss their metal-clad E-series phones. When the Ativ S was announced, E Series immediately came to mind. I thought Nokia should bring back BUSINESS in the game: I want METAL LUMIA!!!!! No dolby sound , No beats music.. No good. No waterproof, No shockproof, No Radio !! Anonymous, 06 Sep 2012These Lumias are for sure a pair of excellent phones, but do not have what it takes to make a ... moreGood points,I wonder though why would you still need an SD card when you have a whopping 32GB reserved for you? TruthSeekr, 06 Sep 2012These are only the beginning...like someone else said WP8 isn't even available yet. Of course ... more"And with a feature-list like this (pureview, HD+, built-in wireless charging) they've got a winner. Maybe two." A smartphone isn't just the hardware it is made of, the software is just as important as the hardware. They have showcased pretty impressive novelties, but do not forget they are pushing/forcing along with those novelties the WP8. If they stuck to being a true phone manufacturer (that is, one that doesn't make exclusive deals that binds them to some marginal OS, but rather one that makes products according to their consumers tastes) their phones would probably sell like hotcakes in their Android variants. But they haven't and now, first of all, they need to convince the crowd to buy WP8 and only then showcase their hardware. But i like what Nokia have given us for specs. Balance. I would of liked a microSD slot for the 920. But Nokia say i don't need it, then i agree. I'll learn to be ok with that. I usually wear snow gloves for a fashion statement , but i can use my phone at the same time, lag free haters! Wow! This yellow 920is great! Throwing out my 4S! Jason, 06 Sep 2012I just don't understand. Is it really that difficult to put a Xenon flash there instead of a ... moreNo, it's super easy to put Xenon flash - you just make the phone thick. Nokia obviously didn't want to do that with the new Lumias, but the 808 PureView was already going to be pretty chunky because of the camera, so they went ahead and put Xenon.